Elevate your girl's special occasion look with our ivory, pink and gold dream dress. Yours to treasure, this gorgeous gown is designed with love and made with signature David Charles craftsmanship. An A-List fashion choice for parties and family events, make sure your little one steals the spotlight in this statement piece. With a chic ivory, pink and gold colourway, note how the soft palette adds definition to our pretty floral design. Lavish tulle layers offer exquisite quality, while puffed balloon-hem sleeves add a fairy tale appeal. Our dream girl's gown includes pastel pink ribbons and a jewel-embellished bow which decorates the waistline to perfection. Concealed zip fastening. 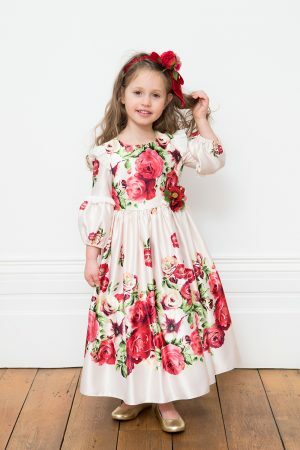 Prepare to be amazed by our cream and red rose fairy tale dress. Wrap your girl in pure luxury as she graces the occasion in this red carpet longer-length edition. The perfect piece to welcome autumn/winter in style, your little one will look radiant as can be for every special date on her calendar. Featuring an on-trend cream, red and green colourway, your princess is sure to feel rosy at first sight in this delightful artisan staple. Ideal for parties and formal events, our fairy tale gown offers a beautiful rose print throughout, and a charming waist corsage to match. The pleated maxi style flows just above floor length and is ideal for when your girl wants to reveal her favourite shoes. Details include puffed elasticized sleeves with ruffle trimmings to compliment your sweetheart's finished look. Introduce a timeless take on special occasion style with our black winter floral tea dress. Sweet and unique, this iconic staple ensures your girl can embrace her femininity with head-to-toe elegance. Available in chic black with fuchsia and frosted pink embroidery, the bold floral accents lend new season flair whenever your little one has an upmarket event on her calendar. Our signature fit and flare silhouette tulle layering adds instant glamour, and your angel is sure to adore the sheer three-quarter sleeves for autumn/winter. This floral tea dress is hand-finished with luxurious velvet waist ribbons and a precious floral buckle. Concealed zip to fasten. Create an optical illusion in our ivory autumn floral tea dress. Exclusively yours, this polished piece is sure to update your girl's new season wardrobe in a heartbeat. A beautiful choice for tea parties and birthdays, watch as your angel celebrates her favourite events in true designer fashion. This David Charles gown captures the charming essence of autumn/winter in all its glory. Our timeless fit and flare silhouette with satin and tulle layering offers sophistication when your daughter needs to look her best. Sheer three-quarter sleeves and bespoke velvet ribbons decorate the waist to perfection, while a sparkling floral buckle adds an iconic finishing touch. Concealed zip fastening. 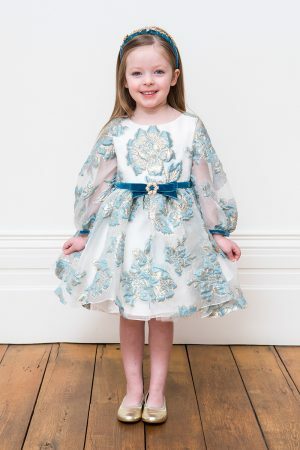 Update your girl's wardrobe with our ice blue flower dress, exclusive to David Charles. Inspired by the change of season, invite a floral bouquet into her evening look with this exclusive gown. This designer dress features a beautiful ice blue, gold and ivory colourway, with a chic A-line silhouette that flatters from every angle. Long balloon-hem sleeves with blue velvet cuffs add a polished finishing touch, and our buckle-adorned waist ribbon ties the look together with two neat velvet bows. Pair with a matching hair band and metallic pumps to complete your angel's seasonal party style. Concealed zip to fasten. Capture your girl's natural radiance with our petal pink flower dress. Exclusively yours, this bespoke new season piece gives a polished look she will love time and time again. 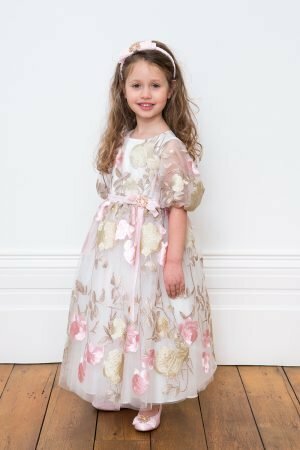 Available in a soft petal pink, gold and ivory colourway, choose this designer gown whenever your angel requires sophistication in her occasion wear. Whether your sweetheart has a family outing or needs a new dress for the holidays, make sure she's one of a kind in this winter wonderland must-have. The smart A-line silhouette with long balloon-hem sleeves offer a feminine appeal, and pretty pink bows serve as the perfect finishing touch. Note the precious floral cluster buckle at the waist, and concealed zip back fastening. Whisk your girl into a dreamland with our royal blue floral bloom gown. A fine choice for special occasions, this signature dress is tailor-made with her favourite events in mind. Whether your sweetheart has a birthday tea party or theatre evening on the cards, this colourpop piece is sure to work in her favour on the fashion front. Available in a regal royal blue colour with artfully-arranged floral embroidery, this dress is designed for angels who love to wear flowers every season. Delicate balloon-hem sleeves add a charming touch, while neatly tied blue velvet ribbons will decorate her waist to perfection. Note the quaint pastel corsage detail and matching velvet hem trimmings. Concealed zip to fasten. Enjoy fairy tale glamour at its best with our pearl pink and gold floral dress. Special occasions call for style poetry in motion, and your girl is sure to exude confidence whenever she steps out in this elegant edition. With an exquisite pearl pink and gold colour palette, our embroidered floral design is made to compliment your angel's finished look. Whether she has a party or performance to attend, your daughter will turn heads wherever she goes in this bespoke gown. Lustrous tulle fabrics offset the ball gown’s silhouette, while tulle balloon-hem sleeves add a polished appeal. New season details include a signature embroidered bow and concealed zip to fasten. Greet the season Cinderella style with our pastel blue and gold floral dress. 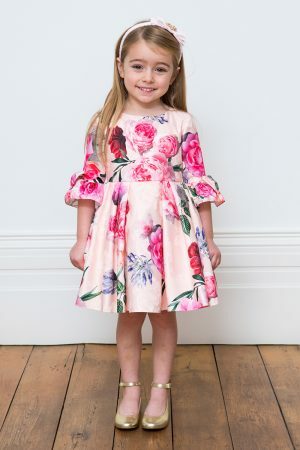 The perfect choice for parties and birthdays, watch your little one light up every occasion in this show stopping gown. Available in a pastel blue colour with artisan gold embroidery, your angel is sure to love the seasonal floral pattern this design offers. Luxe tulle layers present a couture appeal to offset the gown's ballgown silhouette, while embroidered tulle balloon-hem sleeves add a soft new season look. Note the back of this dress which features a signature embroidered bow. Concealed zip fastening. Say it with flowers in our pink peony bouquet dress. Exclusively available from our new season collection, your angel will love everything this pretty piece has to offer. This dress comes in a charming pink colour and offers a statement floral print throughout. Inspired by soft peony flowers, this exquisite designer dress makes a perfect choice for parties and family celebrations that require a luxurious dress-code. Bold pink, fuchsia and green accents illustrate the gown's lifelike bouquet design, which she'll want to show off at every opportune moment. A relaxed style with bow-adorned fluted sleeves give a fresh update for the party season, so your little one stays on-trend. The gown also features a matching oval waist tie and concealed zip to fasten. Create a style spectacle with our jewel green and gold occasion gown. Showcasing exquisite craftsmanship with lavish tulle layering, this five-star dress really is fit for royalty. Available in a majestic jewel green colour with gold embroidered florals throughout, watch as your starlet falls in love with this artisan piece time and time again. Our statement party dress feels soft to the touch and comes in an elegant ball gown style, falling just at the knee. Whenever your girl needs a dress for parties and calendar festivities, this colourful edition will not disappoint. Handcrafted details include puffed cap sleeves and a jewelled embellished velvet ribbon at the waist. Concealed zip fastening. Strike gold with our ivory and gold layered gown. Exclusive for autumn/winter, this luxurious dress has the Midas touch so your girl can sparkle all evening. With an exquisite ivory and gold colourway and rich satin finish, your angel will be the best version of herself whenever she has a special occasion. This designer gown is the gold standard of wedding guest style and includes fabulous floral embroidery with a modern layered silhouette. Artisan foliage details embellish the waistline to perfection, while butterfly sleeves are sure to add a fresh update to your daughter's evening look. Concealed zip fastening. 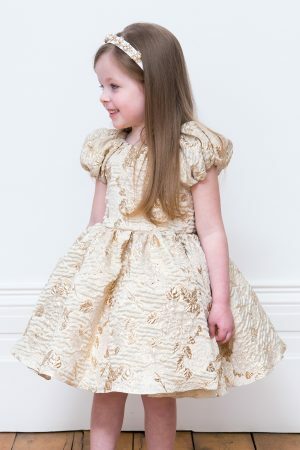 Make it a wedding to remember with our gold leaf flower girl gown. Crafted with excellence, this metallic gold edition is sure to elevate your angel's wedding guest look in time for the new season. 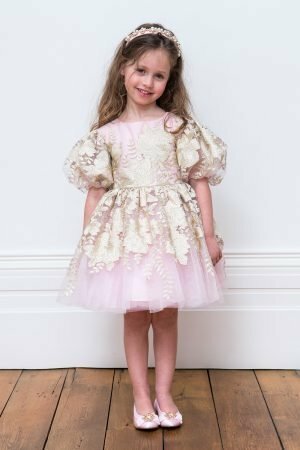 Exclusively available in a pale gold colourway with a luxe textured finish, your little one will be the belle of the ball in this signature style. Our gold leaf motif brocade adds artisan detail, while puff cap sleeves complement this gown's polished ballgown silhouette. Note the oversized sash bow which adds instant flower girl appeal so your princess is always dressed to dazzle. Includes a concealed back zip fastening. 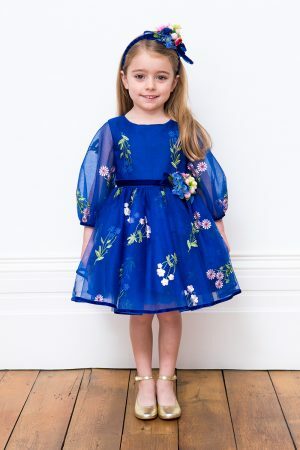 Dress up your little one's occasion look with our navy flower girl gown. Exclusively yours, this dark blue dress is specifically designed to lend a sophisticated note to her party style and wedding guest attire. An ideal choice to welcome the new season, this must-have piece offers a rich light navy blue palette with ornate floral shoulder appliqué to complement your daughter's occasion look. Available in a luxe textured techno finish, your girl is sure to adore every detail this designer dress has to offer. 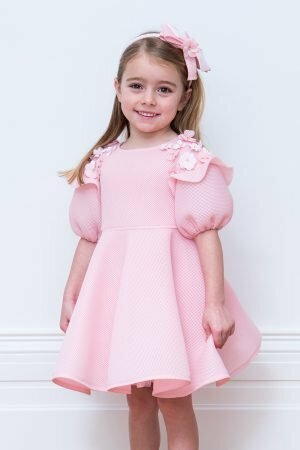 Balloon-hem sleeves are decorated with ruffles for a pretty flower girl appeal, while our flared skirt presents the perfect wedding guest silhouette. Includes a concealed zip back fastening.